AUSTIN, Texas (AP) — Texas’ hotly contested U.S. Senate race accelerated Monday toward potentially the closest finish in decades as Republican Sen. Ted Cruz and Democratic Congressman Beto O’Rourke scraped their polarized bases for any last voters in a burst of final rallies in liberal big cities and Trump-loving suburbs. In Texas, where nearly 4.9 million early voters has already surpassed turnout in the previous midterm elections , O’Rourke and Cruz delivered their anxious supporters similar warnings in a state unaccustomed to close calls: far bigger numbers were still needed. 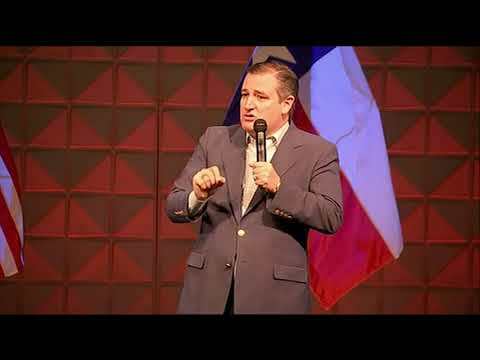 “We’re going to see tomorrow record-breaking Democratic turnout,” Cruz told a crowd in Pearland, a typical Republican stronghold outside Houston, while imploring them to each get five people they know to the polls Tuesday. Polls have shown a surprisingly tight race in Texas, which hasn’t elected a Democrat to the U.S. Senate in 30 years. For Cruz, the stop in a Pearland megachurch was what he called his 48th campaign rally in six weeks — a defensive campaign blitz on Texas’ conservative turf that even a year ago would’ve seemed unnecessary. But O’Rourke’s supercharged, expectation-defying campaign that took him to each of Texas’ 254 counties and raised a blockbuster $70 million has made the race one of the most closely watched in the country heading into Tuesday’s deeply divisive midterm elections, which President Donald Trump is calling a referendum on his combative presidency. For nearly a year, O’Rourke has run as a genial and proudly liberal antidote to the Trump-era GOP and reaffirmed in the closing weeks of his underdog bid that he would vote to impeach, a position that even most Democrats have avoided. O’Rourke began his final full day of campaigning in Houston and Dallas, Texas’ biggest Democratic cities, before making his way home to El Paso. Democrats have been shut out of statewide office in Texas since the 1990s and recent elections haven’t even been close. But at the same time, turnout in Texas so far has also been nothing like recent elections. O’Rourke is planning to cast his own vote Tuesday in El Paso, where he has been a three-term congressman. Cruz already cast his ballot in his hometown of Houston, where he will watch the returns on election night.